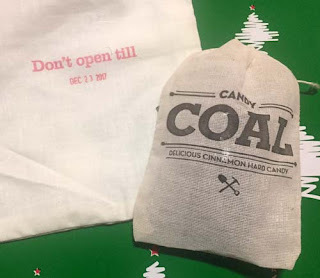 The elves at River City Yarns must think that I've been naughty this year as I found a bag of coal in the Advent Box today. Of course, if the coal is actually cinnamon hard candy, I can't say that I mind. I have finally finished a project that I started months ago. Actually, the knitting was completed many months ago and I've only just attached the pompom. 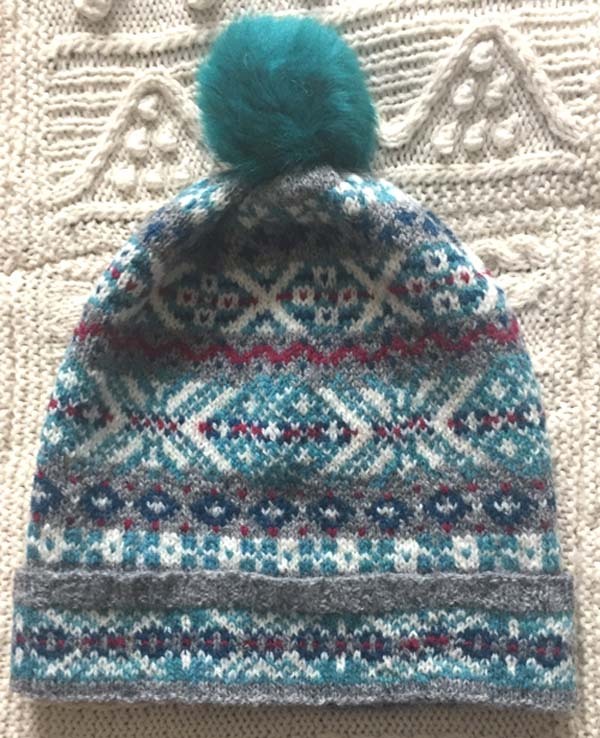 I've combined a very traditional fair isle pattern with a modern furry pompom. I couldn't resist it, or the color. 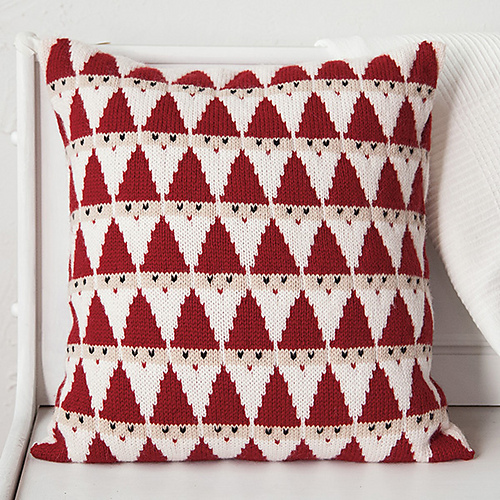 The Kep pattern comes from the island of Fair Isle. It was designed by a local knitter, Anne Sinclair, and offered as a knitalong project for members of the Facebook group "The Fair Isle Fisherman's Kep" only. You have to ask to join the group, but once you do you'll see some beautiful examples of fair isle knitting. 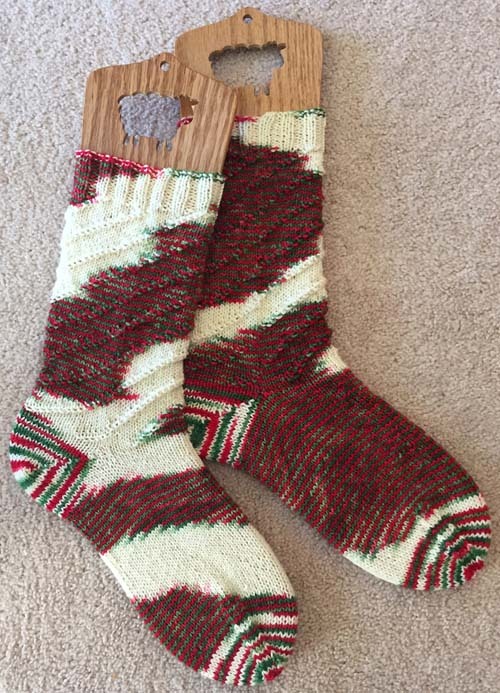 The proceeds from the sale of the pattern go to help support the George Waterston Memorial Museum on Fair Isle. It impresses me that an island with only about 55 inhabitants has a museum. To me, it shows how proud they are of their home and culture. Here is my Fishermen's Kep. It was a very good knitting experience. The hardest part was trying to decide what colors to use. Traditionally, five are used. I decided to make the hat to go with a pair of mittens I made last year, adding two extra colors. 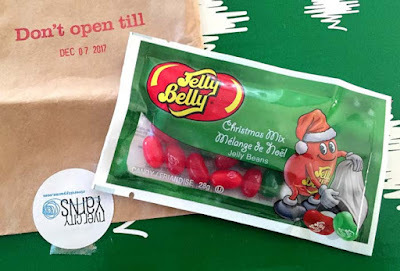 I'm getting down to the last of the Advent Box surprises. The month has passed by quickly. 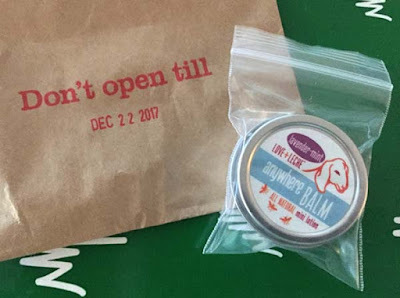 Today I found a little tin of "anywhere BALM", just the right size to pop into my knitting bag. It's no secret among those who know me that I'm more than a little enamored with everything to do with knitting in Shetland. I feel very fortunate to have enjoyed two wonderful visits to this fabulous place. It's not just the knitting that draws me in, but the people and scenery, too. I just like it all so much. I have a LOT of Shetland wool - and some Shetland-type wool, such as that from Harrisville Designs. Some of the wool I bought myself. Most of it, however, was given to me by very, very generous friends: P, M, J and P. Thank you ladies. I've have many projects that I want to make and look forward to jumping right in after the new year. 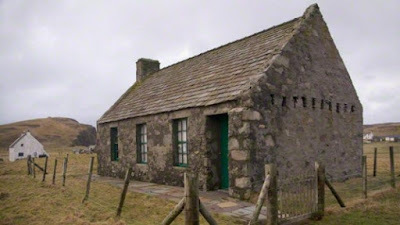 I saw this short video about sweaters from Fair Isle, one of the Shetland Islands. I found it to be very interesting. 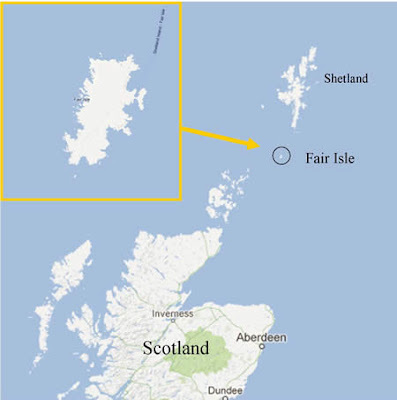 By the way, did you know that the island of Fair Isle has a population of only about 55. I'll have a little more about Fair Isle in my next post and well as a finished object. 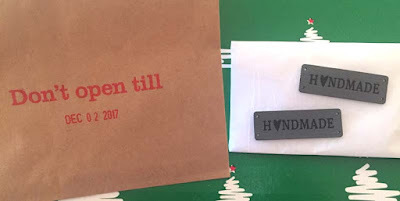 Today there was a very nice surprise in the Advent Box. A long time ago I downloaded a pattern for the Bluebird of Happiness. I intended to make it for my Christmas tree. Well, other projects came along and it was forgotten. Today, in the box, was a link to the pattern and enough yarn to make 3 birds. I'll have a bluebird or two or three on my Christmas tree next year. If you want to buy clothes, do you think of going to Bed, Bath & Beyond? Me neither. I stopped in last night after work and there, by the door, were two types of sweaters. 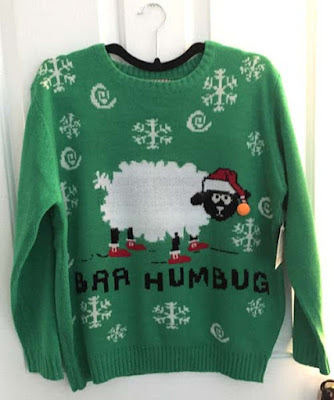 One had an alpaca on the front, but I was drawn to the BAA Humbug Sheep design. There was only one left in my size, so I claimed it/him/her! Poor sheep - it needed a good home. I like ugly Christmas sweaters. I think that they are fun, and we can use all the fun we can get these days. I don't care if the sweater is made of 100% acrylic. This is not the time to be a yarn snob! I like the sheep's red shoes and the orange pompom on his hat. Guess what I'm wearing to work today? I think that the sheep needs a name. And reminder about the Stash Jar contest. 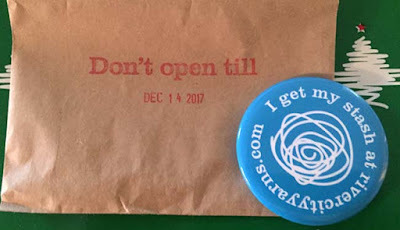 Check out the post from December 14th. Happy First Day of Winter - and shortest day of the year. Winter has definitely come to the Calgary area and it's going to be a white Christmas for sure. I don't know what it is about gnomes, but I like them a lot. They are just so darned cute. I've knitted one in the past, with a more planned for sometime in the not-too-distant future. Now, on opening today's Advent Box, I can see that I'll be needle felting a pair of gnomes. I've done a bit of needle felting in the past, but not much. I'm looking forward to this project, although I won't get to it for a while. 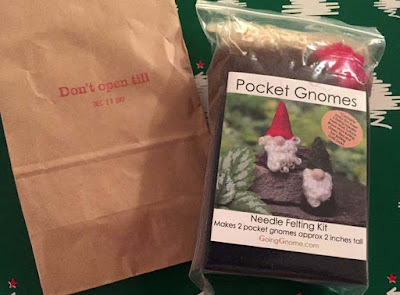 The kit has everything I'll need: the yarn, needle and a foam pad. 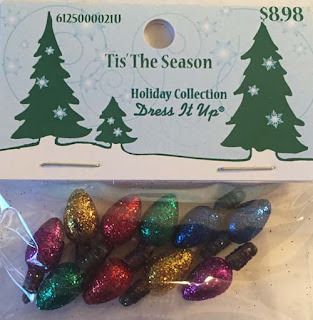 I just hope that mine will turn out as good as the ones in the pattern photo. This is a first. I've never had reindeer noses before, but that's what is in the Advent Box today. They look yummy! This looks like fun. 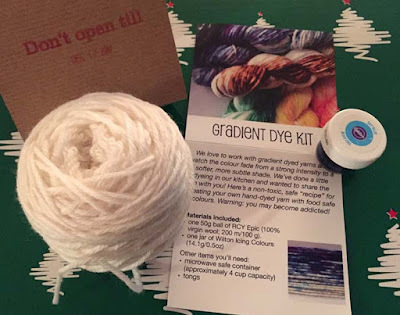 There is a small gradient dye kit in today's Advent Box. I've been interested in dyeing for some time. 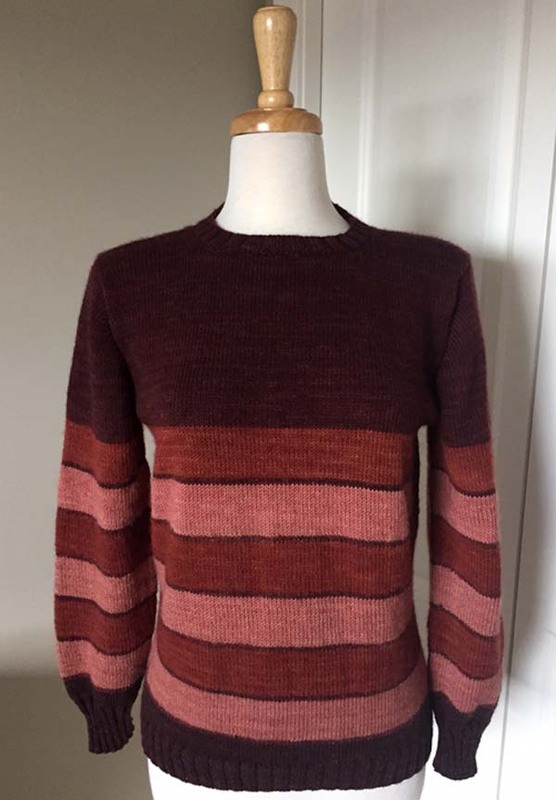 I've taken a couple of classes, bought undyed yarn and the dyes as well as rescuing an old microwave that was destined for the garbage to use only for dyeing. I've read many books, everything I could find at the library. What I haven't done is take the leap into dyeing on my own. With this kit, I'm sure that I will. Not only is this a dyeing kit, but it's a gradient dyeing kit. I'm looking forward to giving it a try in the new year. 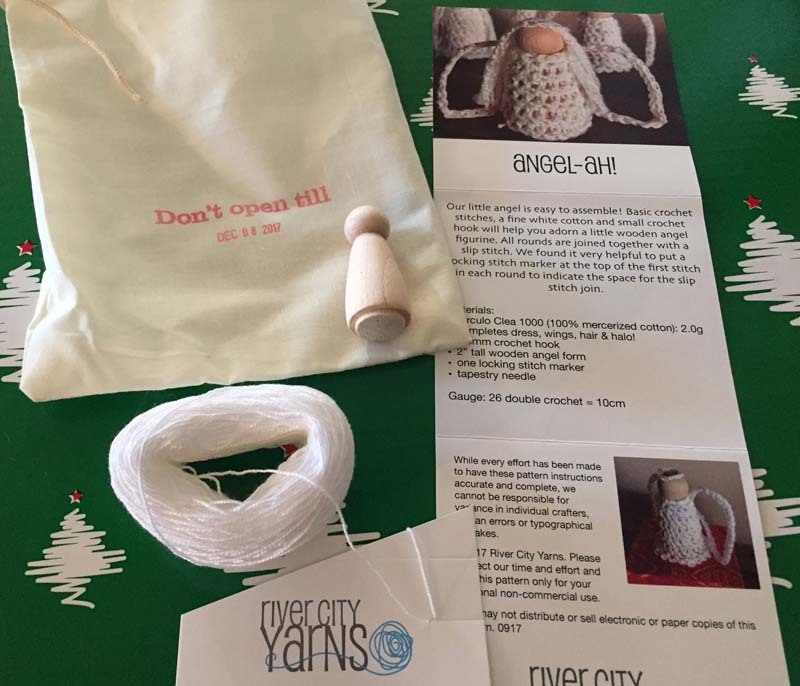 There is a little kit in today's Advent Box - the yarn, instructions and a little tea light to make a Christmas tree. 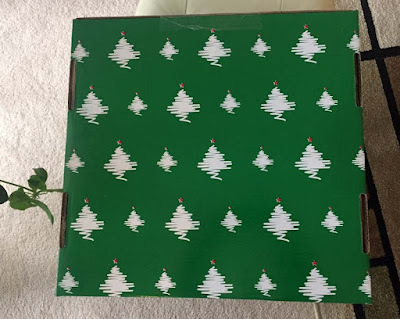 I'm afraid that I won't be making this tree. 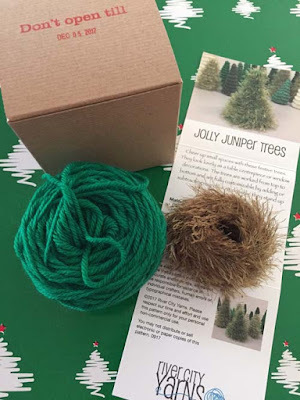 It requires starch that you can buy or make, but once the tree is completed it is fragile. It would be lovely for this Christmas, but I just know it will get squashed in the box after Christmas and not look so good for next year. Not to worry, though. The yarn will be used for something else and I'm already thinking about uses for the little plastic tea light. 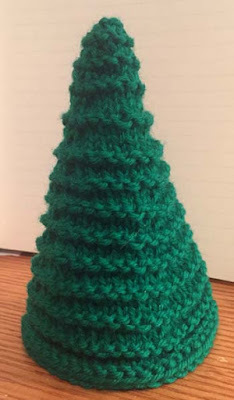 About a week ago there was small kit to make a little knitted Christmas tree and I wondered if the tree needed decorating. I think that it does and I found these Christmas lights in Fabricland. The length of the light, not including the black end, is about a half inch. I can't talk about what's on my needles at the moment as it's something for Christmas and I don't want to spoil the surprise. I wonder how many others are knitting secret Christmas items. 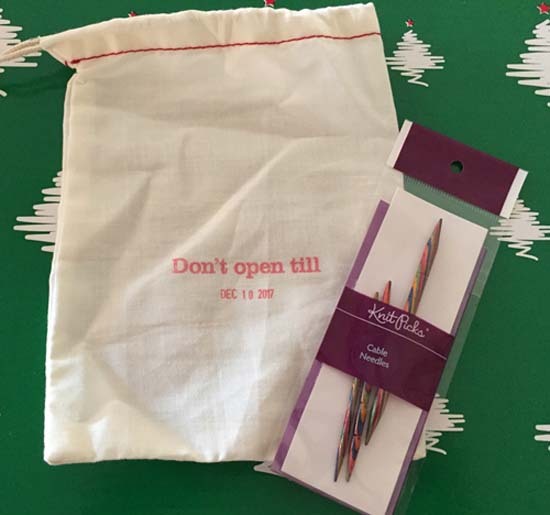 Today's Advent Box gift is something very useful: 3 wool needles in a handy little plastic case. This is going directly into my knitting bag. I like that the case is in one of my favorite colors. I moved to Airdrie, Alberta from Calgary at the end of August. It wasn't a big move, only a few miles. 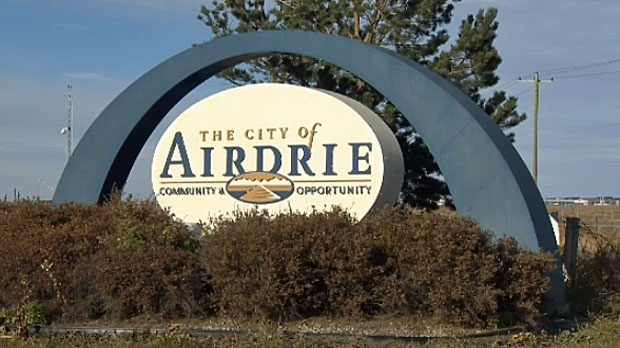 Airdrie is a smaller city and my first impression is how community oriented this place is. Pretty much all the amenities that you may want or need are right here - except a yarn shop. I didn't mind too much as Calgary is so close and I really (REALLY) don't need any more yarn. 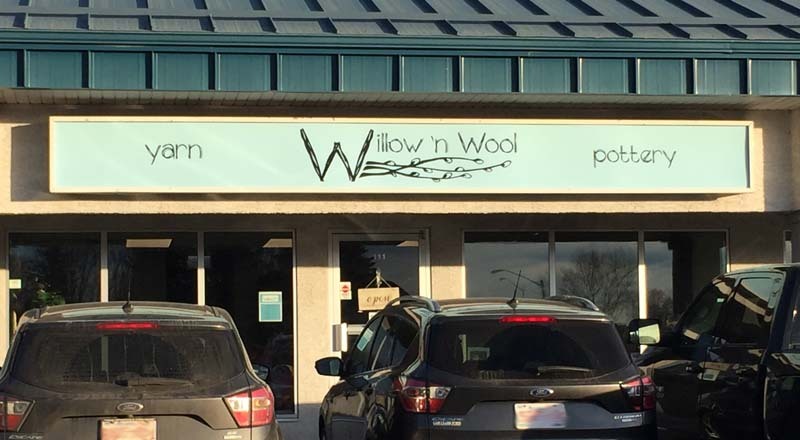 However, about 3 weeks ago a yarn shop opened in Airdrie. While I don't need anything, it's nice to know that there is a shop about 5 minutes away from home. It's called Willow 'n Wool. 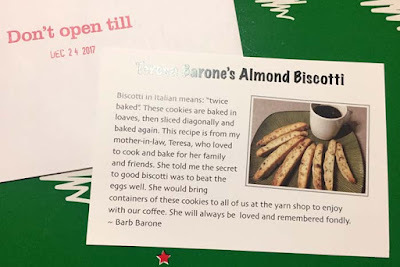 I stopped in yesterday and spent a good bit of time talking with the lovely owner, Barb. She told me that it is a family-run business and what the various family members do in the shop, e.g. her daughter makes the pottery bowls, mugs, etc. which are very nice. 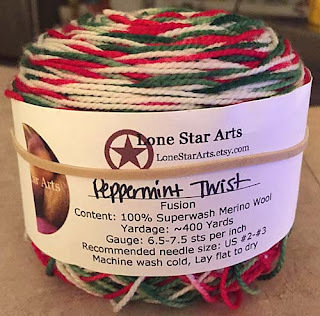 There is a good variety of yarn - and a nice selection of Canadian brands: Ancient Arts (one of my favorites), Creek Garden, and Polka Dot Creek among them. Sweet Georgia is coming soon. 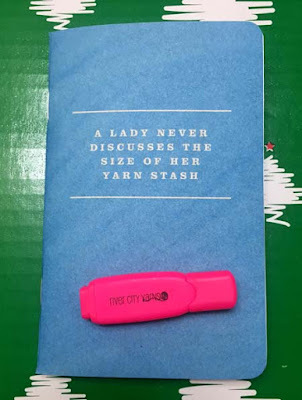 We talked about knitting trends, knitting patterns, furniture for the store, etc. I totally forgot to take pictures inside the shop. 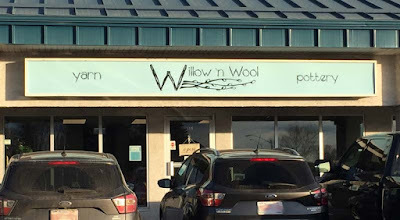 I'm very glad that Willow 'n Wool has come to town. By the way, if you watch the Hometown Hockey series on TV, it's coming from Airdrie this weekend. 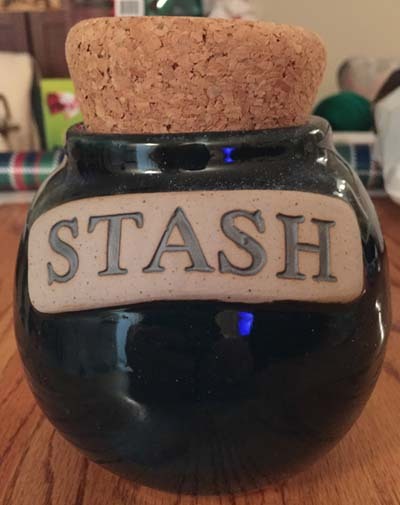 And speaking of stash, how would you like to win a Stash jar? It's a Word Jar from Tumbleweed Pottery. 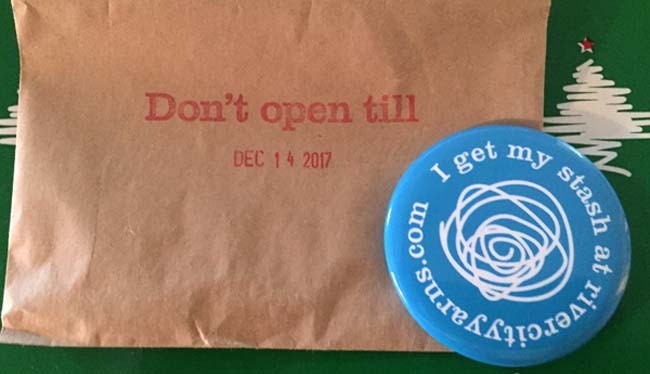 I use mine as a bank and I put in any loose change, knowing that the money will likely be destined to buy something knitting-related. But, you could use for anything: bits of yarn leftover from a project, notions, as a yarn bowl. The possibilities are endless. 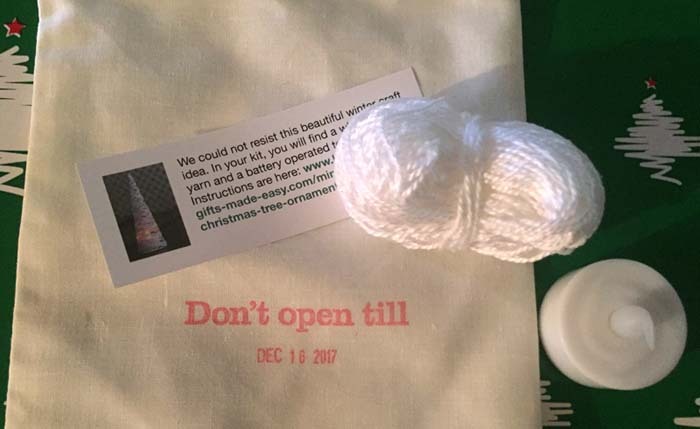 All you have to do to be entered in the contest is leave a comment and tell me what you'd use a Stash Jar for, knitting-related or not. I'll announce the winner, chosen at random, in a post on January 1st. What a nice way to start the new year - and, yes, I'll mail it wherever the winner lives, any country. 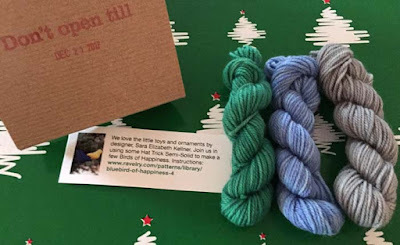 Today's little Advent Box contained a ball of RCY's Eden yarn and a download code for boot toppers. While I know I won't wear boot toppers, nice as they are, I won't complain at all about adding some Eden yarn to my stash. 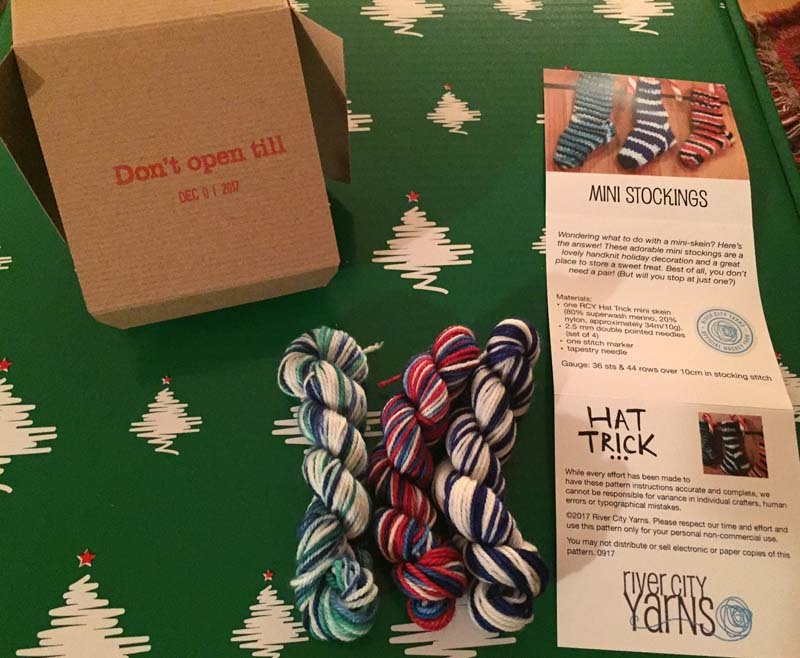 The content is 81% Merino, 9% Cashmere and 10% Nylon. I think that it's a DK weight and at this time of year, green yarn is always good to have. Today's package in the Advent Box was a set of cable needles, useful tools. My plan for the new year is to focus mainly on sweaters. I'm curious to see how many I can complete before December 31, 2018. Some of these sweaters have already been started and I'm looking forward to finishing and wearing them. My key word for the year is COMPLETION. I'd like to have 4 new sweaters by year's end and it should be do-able since I'll be retired. But, I'm hoping for more than 4. First up: The Hairst Yoke Cardigan. It was originally started in 2016 but my gauge was off so I restarted in July 2017. One sleeve (my new gauge swatch) is done. 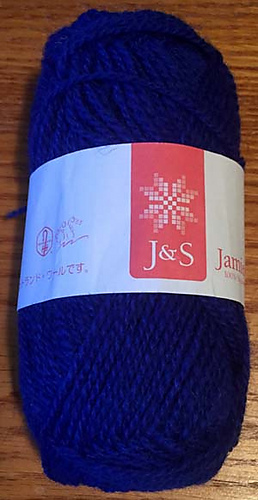 I bought the main color, a lovely cobalt blue (#18) at Jamieson & Smith in Lerwick, Shetland, in September 2015. I haven't decided on the colors for the yoke yet. I have a great range of Shetland wool in my stash to choose from, thanks to what I had and the generosity of some friends (P, M, J and P - thanks ladies). I'm open to suggestions. 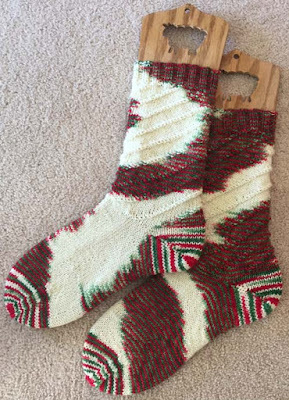 After taking the fair isle workshop with Janine Bajus last spring, I think I must swatch to see what colors go well together. It's not enough to put them side-by-side in the balls. You have to see how the colors interact with each other. Speed swatching is your friend! 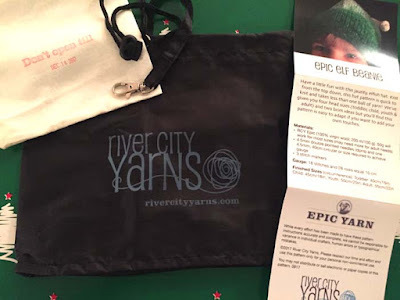 The elves at River City Yarns must be mind readers. How did they know about my sweet tooth? And, how did they know that I'm particularly fond of Jelly Belly candies? I was lucky enough to visit the factory in Fairfield, California last March. These candies won't still be around on the 25th! Today's Advent Box surprise goes hand in hand with yesterday's silicone tea bag. It's Maple Tea from River City Yarns. How very unique and very Canadian. The ingredients are: black tea, brittle (sugar, hazelnut), maple syrup, flavour. It sounds like it'll be sweet, which is fine by me. One of the reasons I'll normally only have one cup a tea in a day is because I like it sweet. 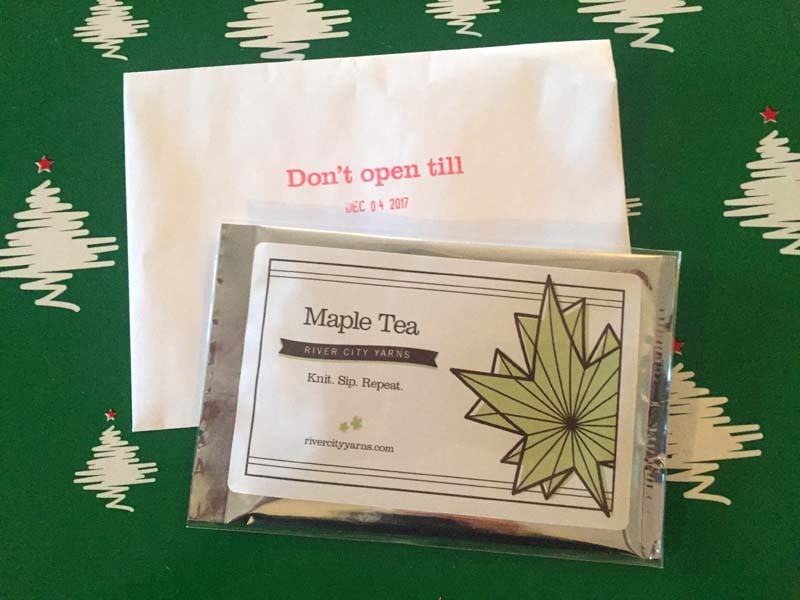 I can't wait to try this Maple Tea. 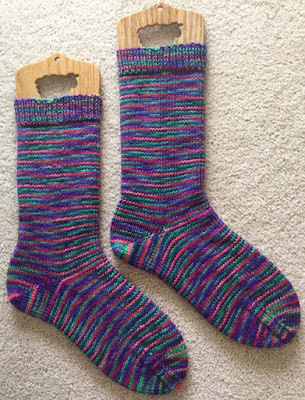 I'm continuing to play catch-up with recording my finished projects - and they aren't all socks! 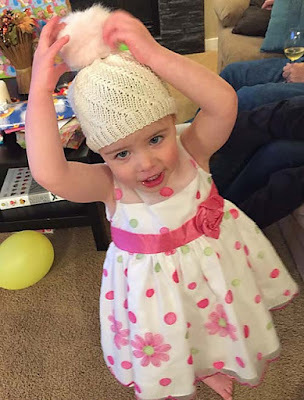 This time it's a hat that I made for my granddaughter, Alyssa, for her second birthday on October 15th. 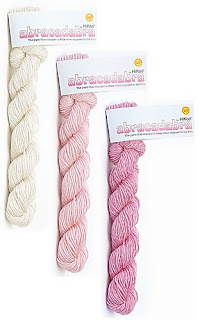 I found a skein of amazing yarn called Abracadabra by HiKoo. 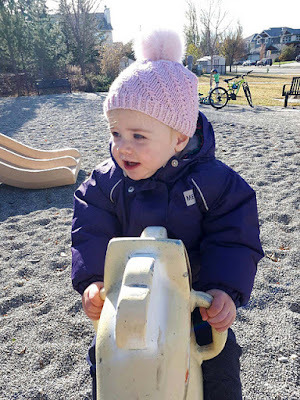 What's amazing about it is that it appears to be white when you are inside, but when you go outside in the sun the color changes to pink very quickly. There was just enough yarn for the hat - about a yard left over. I followed an excellent pattern called Whorl. It's well-written, a quick and easy pattern with just enough interest to keep it from being boring. I expect that I'll make another Whorl hat someday. Yarn contents: 35% Superwash Merino, 50% Polypropylene and 15% Nylon. It's a DK weight, 100 yards in the 50 gram skein. The yarn is not terribly soft, feels rather plastic-y. I expect that's down to the polypropylene content, but it's not unpleasant. The yarn is now discontinued and I was glad that there was enough yarn for the hat and that I didn't run out. The only difficulty I had was sewing on the pompom. It very dense at the core and it was hard to get a needle through. Next time, I'm looking for my thimble as I have another pompom for another hat (for me) yet to do. 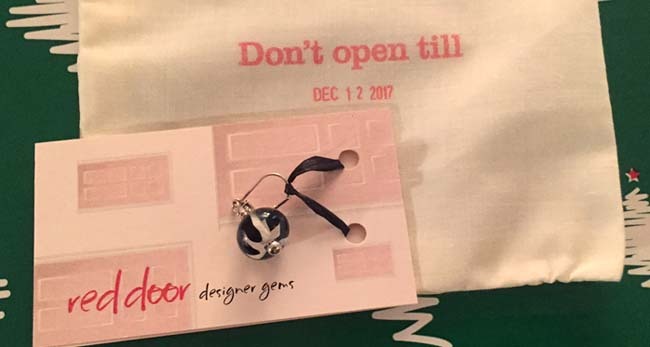 The December 2nd surprise in the Advent Box was in a very small brown bag. I couldn't imagine what I was going to find. Inside were two little tags with the word "H♥NDMADE" on each of them. They are very cute, made with a heavy fabric, perhaps a heavy demin or canvas? I've never seen these tags anywhere before. I think I may sew each of them onto a couple of afghans that I'm making. I'll be catching up on finished objects for a little while - mostly, but not all, socks. Next up, socks using the exclusive monthly colorway from The Loopy Ewe. stocking stitch leg, short row heel, stocking stitch foot, shaped toe. 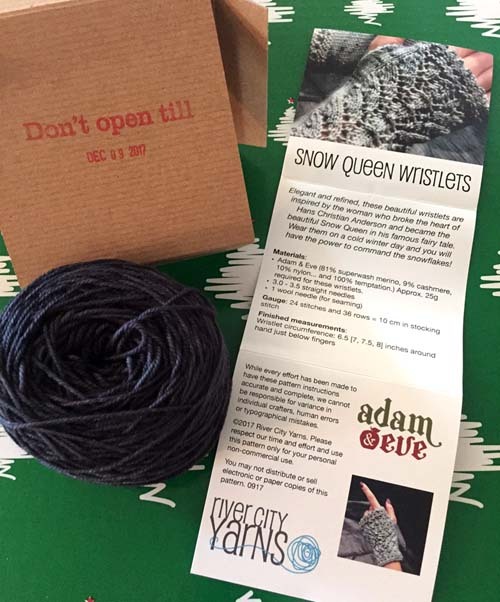 Each month The Loopy Ewe offers an exclusive colorway. This one is from November, 2016. 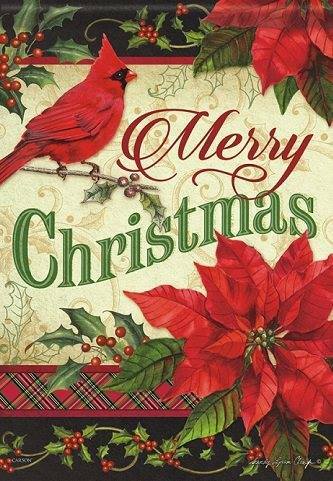 It's hard to believe that December is here now and that Christmas is only a few weeks away. It sneaks up on me every year without fail. 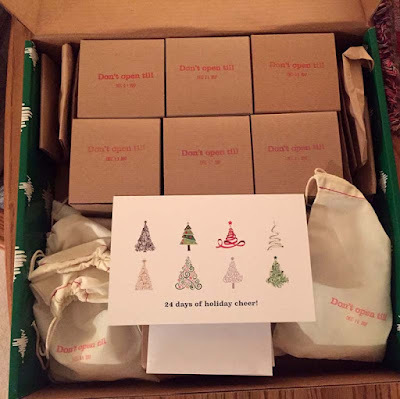 Who doesn't love an Advent countdown to the 25th? 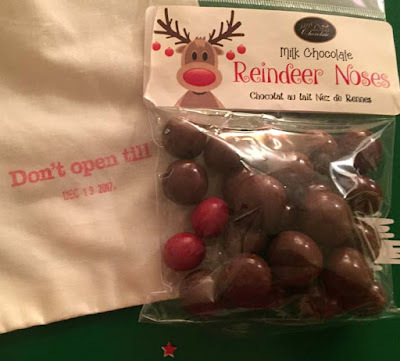 How many of you have a chocolate Advent calendar that you're starting today? River City Yarns in Edmonton, Alberta produced an Advent Box for knitters. What a great idea. They sold out very quickly. I picked mine up when I was in Edmonton for the Roger Waters concert. More on that in another post. 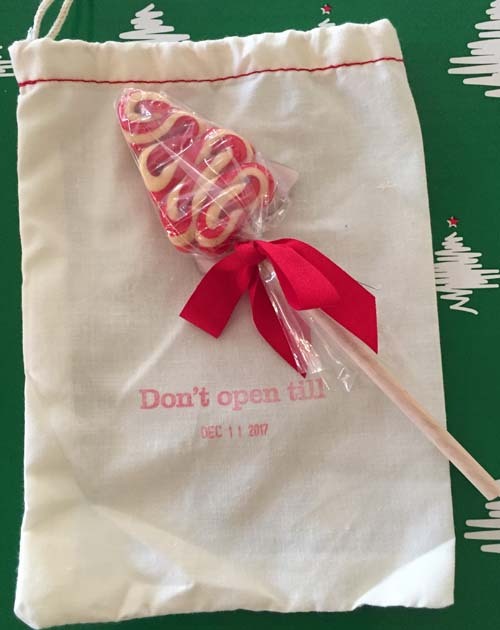 There is card with an introduction to the Advent Box, also little boxes, paper bags and cloth drawstring bags. 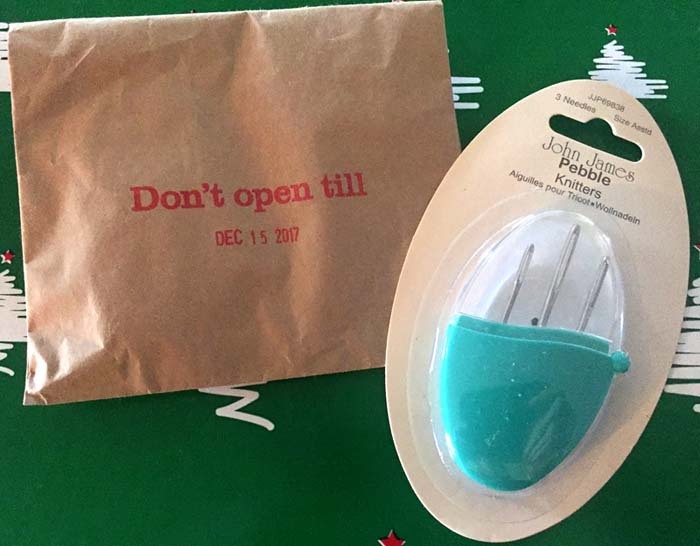 Each has been stamped with "Don't open till .... and the date". The elves at River City have hand picked and hand packed each day's gift. The theme this year is "O Tannenbaum", from a German folk song. Loving Germany as I do, I'm now even more eager to see what inside each day and see if it ties in with the theme. So, today, I can open the first box. Ta-dahhhh!! Wow....this is cool and what a great way to start the month. Inside were 3 mini skeins of their exclusive sock yarn called Hat Trick as well as a pattern to make Mini Stockings. These will make adorable ornaments for the tree, even if they don't represent my team, the Colorado Avalanche. It's hockey, it's knitting, it's all good and I'm really liking the first gift. Which reminds, me. I have a large skein in the Avalanche colorway in my stash. 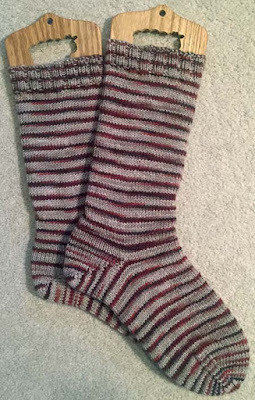 After I make myself a pair of socks, or whatever, I can make an additional Mini Stocking later on. I don't know if everyone gets the same hockey teams represented by the minis. I think that mine are, from left to right: Vancouver Canucks, Montreal Canadiens and the Toronto Maple Leafs. I wonder what's coming for December 2nd. Check back again if you'd like to know, too. 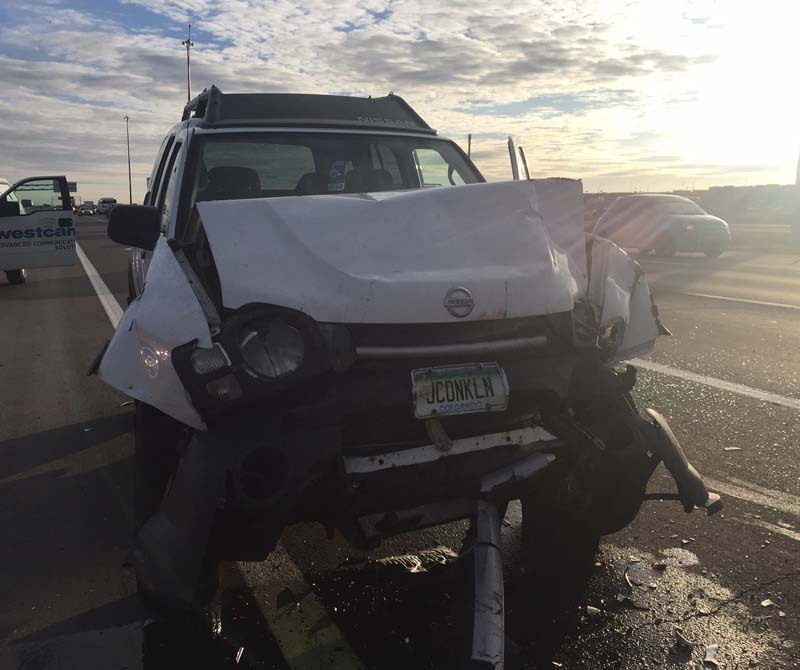 It's been quite a month since my accident but everything is going well. My bones are mending, my vehicle has been replaced and in just under three weeks, I'll be returning to work. I've been knitting a little more, but still not "up to speed" yet, but I'm getting there. I have finished a couple of things and I'll start catching up. The socks for October are complete, so I'll start there. Thanks for coming back and visiting. 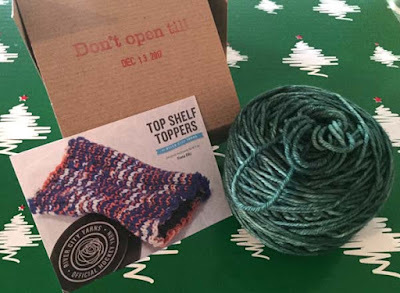 Each month The Loopy Ewe offers an exclusive colorway. This one is from October, 2016.